In their own words, Nisei veterans recount their battles against wartime suspicion and racism in ‘Twice Heroes’ now available for JACL Members for a special discount. San Francisco writer and photographer Tom Graves’ book “Twice Heroes: America’s Nisei Veterans of WWII and Korea” is now available for JACL Members for a discounted price. The book, which earned the 2014 IBPA Benjamin Franklin Award in History, educates audiences on the meaning and service of veterans in the Japanese American experience. Graves first heard of the 442nd in 2001 where he met veteran Lawson Sakai, sparking his curiosity and passion to tell other stories from veterans. 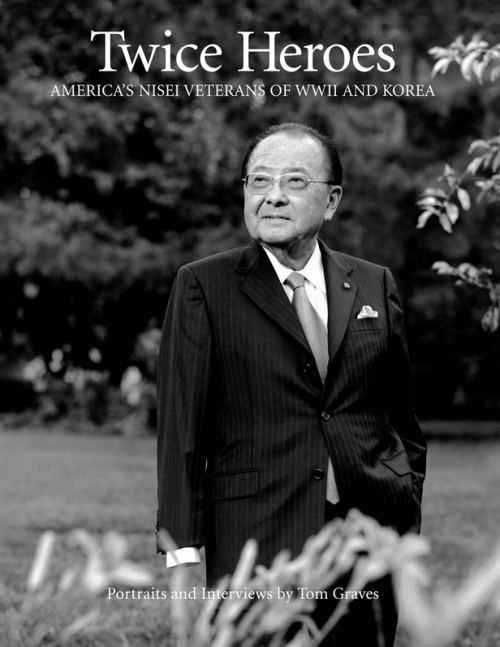 Portraits of 98 veterans grace the oversize pages of “Twice Heroes” along with dozens of interviews of MIS, 100th and 442nd veterans, including the late Sen. Daniel Inouye, Sec. Norman Y. Mineta and Gov. George Ariyoshi. Four Medal of Honor recipients also appear in the book, along with “regular GI’s” –husbands, fathers, uncles and grandfathers of many families tell their story in the book. Order now at Twice Heroes and enter the coupon code JACLHEROES at checkout for a copy.